Mariano Cardinal Rampolla y Tindari is little remembered today - but, had the conclave of 1903 been allowed to proceed without interference, he would have been pope. Mariano Rampolla had risen through the Catholic hierarchy - a Papal Nuncio to Spain, he was elevated to the Cardinalate in March 1887, being appointed Papal Secretary of State three weeks later. His secretary in both postings was one Giacomo della Chiesi. Rampolla's policies were seen as being pro-French and against the Triple Alliance. He was also regarded as taking on a dominant role with the elderly Leo XIII (elected 1878 in his late sixties) and seen as overbearing. Francis Joseph of Austria Hungary had been displeased by the way in which Rampolla had denied a church funeral for Crown Prince Rudolph when the latter had committed suicide. While the Cardinals were supposedly neutral in papal elections, they were often subject to secular and other influences: various states and organisations favoured or opposed particular candidates on a range of grounds. Three countries in particular, Austria-Hungary, France, and Spain had, on the basis of earlier protection supplied to the Papacy, claimed the right of veto against particular candidates they felt would not operate in the State's best interests. In some periods this was accepted as a trade-off - but with the rise of non-monarchical government the situation became somewhat anomalous. 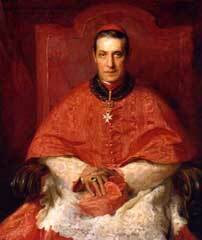 Pope Leo XIII died in 1903, aged 93, having been in failing health for some time. The usual jockeying occurred among the cardinals thereafter and Rampolla was seen as a leading candidate among several papabiles. 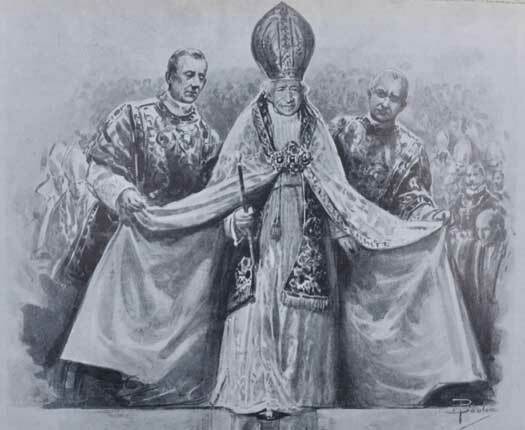 During the conclave support for Rampolla was reaching a sufficient level to win him the election, when Cardinal Jan Puzyna de Kosielsko, archbishop of Krakow, on behalf of Franz Joseph I of Austria-Hungary, delivered the veto (Jus Exclusivae). This was accepted under protest by the other cardinals and Giuseppe Sarto, patriarch of Venice, was elected Pius X. Dislike of Rampolla and also his pro-French policy may have played some part in the acceptance of the situation. Cardinal Jan Puzyna de Kosielsko was reprimanded by the Vatican authorities for his role in events, but given a medal by the Austro-Hungarian authorities. Pope Pius X promptly abolished the veto. Cardinal Rampolla, after retiring as secretary of state, took on an archivist role linked to the Vatican libraries. He faded from the newspapers until his nephew, the Duca Francisco di Campobello, who spent excessively and forged his uncle's signature on cheques, came to public notoriety. Rampolla, on the first occasion, repudiated the cheques and initially bailed his nephew: on a subsequent court case for the same offences he did not, and the duke was sent to jail. There were some suggestions that Rampolla would be a papabile for the next election, but, having been ill for some time he died, somewhat unexpectedly in December 1913 . There was a flurry of activity concerning his will thereafter - the only one that could be found was decades old, and had gifts to persons long dead, while there was an indication of a more recent will. The resolution of the story is not indicated in the English language papers. Rampolla was buried in a rather ornate tomb in St Cecilia in Trastevere. Pius X died a few months later, in August 1914: any possibility of the Jus Exclusivae being applied was limited, probably in part given the European political crisis that was shortly to lead to the First World War. Giacomo della Chiesi, Rampolla's sometime secretary, became Pope Benedict XV, dying in 1922, the same year as Francis Joseph's heir Karl I. The papal veto was by this time a distant memory. An acurious coincidence is that some seventy-five years later, the patriarch of Venice was again elected Pope, as John Paul I. He died a little more than a month later and was succeeded by the archbishop of Krakow, who became John Paul II.